Morris has been an icon of equestrian sport, with a silver medal from the 1960 Olympic Games, wins in the ASPCA Maclay and AHSA Medal Finals, and a training empire that includes most of today's top equestrians. 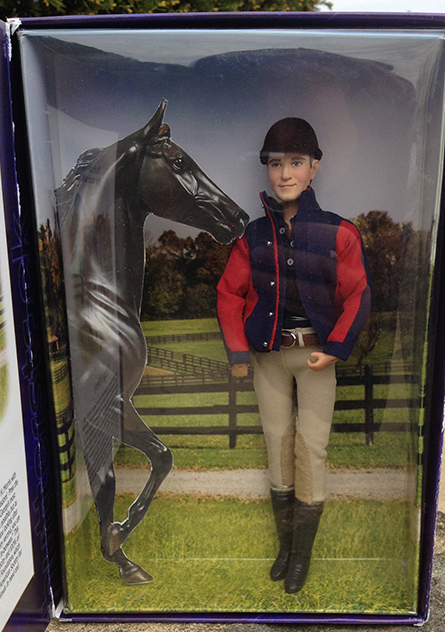 The 8-inch George Morris Talking Action Figure, an idea created by Mark Bellissimo, in association with George Morris and Stephanie Macejko of Breyer Horses, as a means to raise funds for equestrian-based charities, will launch its 2015 special edition to honor the living legend at the Rolex Central Park Horse Show. Breyer, maker of the world's finest model horses, created the action figure, which will be packaged in a collector's box with a general overview of George's brilliant career. Always wanted a private lesson with George H. Morris? 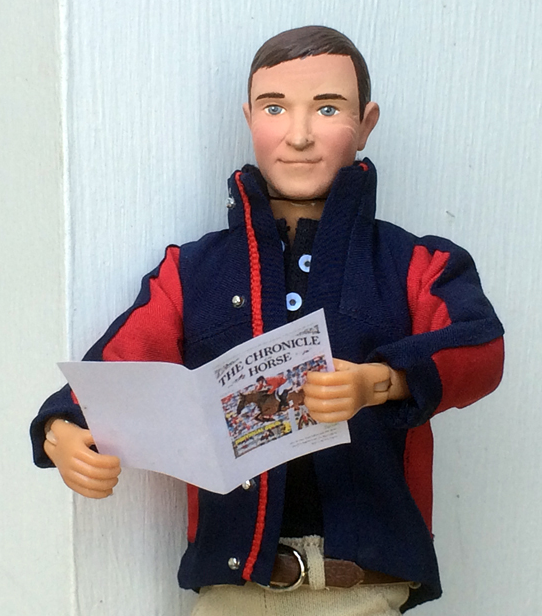 Now you can have the next best thing: your own talking action figure! Check out the video to hear him speak! The limited edition talking action figure plays 20 of George's classic quotes, such as, "Practice, my dears, doesn't make perfect; perfect practice makes perfect," and "My dear, if I have an aneurysm, it's your fault," in his own voice. These words of wisdom might inspire you to sit up straighter and keep your heels down, but you can also feel good that 100 percent of the net proceeds will go into the Chronicle Support Network's Fidelity Charitable Gift Fund. T he Chronicle of the Horse and its owners, Mark and Katherine Bellissimo, are launching the Chronicle Support Network, through coth.com, to create a national directory of 501c3 equestrian-related charities. The mission of the CSN is to identify and honor those great organizations and individuals who embrace horses and horsemanship to effect change in the community. The Bellissimo family will seed the fund with $50,000. Mark Bellissimo commented, "There are so many great charities and individuals who incorporate horses either directly or indirectly to serve those in need, those organizations dedicated to protecting these great animals, or any other organizations who promote affordable access to horses and horsemanship. Katherine and I thought it is critical for us to 'chronicle' these efforts in a central place that will allow for these organizations and individuals to tell their stories as well as create network for collaboration and fund raising. Our goal is to raise and distribute millions in this effort." Katherine added, "We are honored to include both George Morris and Breyer's Tony Fleischmann as partners in our first fundraising effort on this initiative." The Bellissimos and their daughter Paige are founders of "The Great Charity Challenge," an annual equestrian event in Palm Beach County, Fla., that has raised and distributed $8 million dollars over the last six years in support of Palm Beach County Charities. Chronicle and Untacked), and its social media pages. This extensive COTH community will engage in identifying worthy charities as well as providing online voting for six nominations for CSN equestrian philanthropist of the year to honor an individual who uses some form of equestrianism to promote a greater good in the community (which can be for equestrian or non-equestrian activities). A committee will select from the nominations, and the winner will be announced annually at the Rolex Central Park Horse Show. An initial grant opportunity will be awarded during the Friday Night U.S. Open Show Jumping event, Sept. 25, at the Rolex Central Park Horse Show. 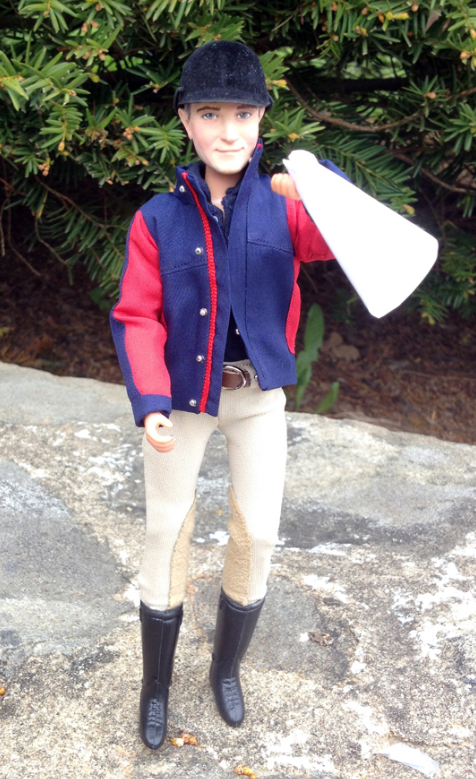 Once you have your action figure, join us in a "Where In The World Is George" campaign to show us all the places where George Morris is making appearances - at shows, in stables (hope they are spotless! ), or maybe at your dinner table (if you're looking to lose weight!). "I thought it was a fun idea of Mark's," said Morris. "I support that all the proceeds go to charity work, and it was a fun thing to do. I'm very supportive of it." "At Breyer, we celebrate the spirit of the horse every day, and no one has celebrated the horse and the art of equitation like George Morris," said Fleischmann, President of Reeves International, Breyer's parent corporation. "It's been fun to work on this project with George and Mark Bellissimo, whose vision and passion for sharing all that is good about horses and the horse world we share. We're delighted that the proceeds of the project will support the CSN to help horses and horse people, and we're proud to have contributed to funding this project." CSN funds will be directed via random grants, online contests or special grants. COTH shall reserve the right for final decision on acceptance into the network and the techniques to distribute funds. COTH will have the right to appoint a group to approve distributions from the Fund. 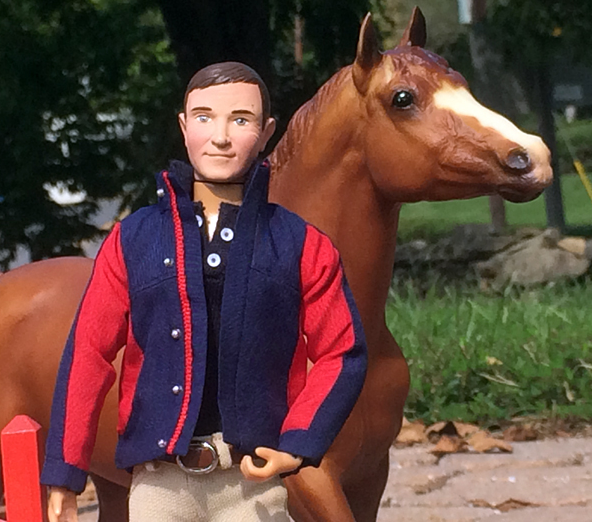 For horse-crazy girls, there are only two kinds of horses: real horses and Breyer model horses. The iconic Breyer brand, a division of Reeves International, was founded in 1950 and is the leader in creating the world's most authentic and realistic model horses for play and collecting. These hand-painted, collectable model horses and animals have a worldwide following, thanks to the incredible sculptures that form the foundation of the line. Today, Breyer has expanded its play lines to include play sets, craft activities and horsey accessories for its younger fans. Its collector lines include resins, crystal and porcelain. To see the complete line of Breyer horses and to learn more about Breyer events and the model horse hobby, visit us at BreyerHorses.com.